Just as you would expect with any important theatrical event today, major Edo-period kabuki performances inspired a wide assortment of printed material. Colorful, intriguing actor prints (yakusha-e) stand out in most people's minds, but the woodblock industry also turned out products like texts for home study (e-iri nehon), actor-related poetry surimono, critic's reviews (hyobanki), and reduced-sized black and white prints for hobbyists (sumizuri-e), not to mention novelty souvenirs and fan mementos of various stripes. And then there were the banzuke. Banzuke means "list" or "program" and along with the above, all competing with the painted hoardings and cloth banners on the street for a fan's attention, was an additional flurry of washi paper that included advance promotional flybills (tsuji banzuke), illustrated pamphlets (ehon banzuke), charts with playful actor rankings (mitate banzuke), broadsheets announcing a theater's annual line-up (kaomise banzuke), and more. Today, such ephemera are hard to find and, since they are generally without color or even images, even harder for a non-specialist to develop an interest in. But archival institutions love banzuke, and a serious kabuki researcher can spend an entire career poring over them. Indeed, it is thanks to boring-looking banzuke that the important work of assigning specific dates and theaters and play names to actor prints can progress year by year. And sometimes one of the unassuming sheets can offer up far more — a name or a hand-written comment that contributes to the complex jigsaw puzzle that scholars are trying to piece together to better understand Edo period society. It is also possible for a banzuke to excite a distinct non-academic type like myself. Several years ago when Fig. 1 (illustrated on the right) fell into my hands, I knew from the general layout that this hosoban stencil sheet was part of the charming Kyoto publishing tradition called Gion nerimono, prints published over during the 1810s to commemorate the fancy costume parade of courtesans that (c. 1765 to 1839) complemented the ancient capital's 1,000 year-old Gion Festival. Such prints are never dated in reference works — "ca. 1818" being the stock caption. Worse, my hosoban sported pigments, a look and an artist's name, Harusada (n.d.), that seemed to place it at least a decade later than all others. What was the deal? The puzzle gnawed at me. I finally grew resigned to never knowing any more than the names and affiliation of the beauties posing as silk workers — Riki and Kotami from the teahouse Tamaya. However, the other day a Gion e-banzuke (illustrated program) — a detail of which can be seen in Fig. 2 (at top) — peeked out at me from a print dealer's bin. Though I was aware of the existence of Gion banzuke, (inevitable, given the Japanese inability to enjoy an event without a program in their hands), they are truly scarce and, like most of their kabuki cousins, sometimes consist of simply a non-descript list of names. 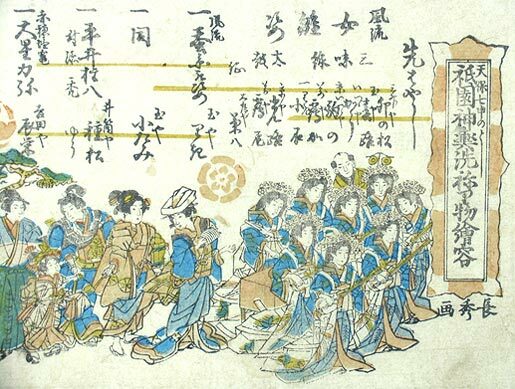 In comparison, this e-banzuke — a single sheet measuring 35 x 47 cm — features in thumbnail an expansive overview of the entire parade in five colors (stenciled), and is signed Nagahide (fl. 1805-42), the dean of Gion nerimono hosoban print designers. Much more importantly, not far from the date in the cartouche (1836) are two lovelies carrying a spindle and a bucket. Could they be ... yes! Above their heads are written the names Riki and Kotami! At last, the gods of collecting being not entirely unmerciful, supporting evidence had materialized that (1) provided me with a fine wide-angle view of that long-ago parade to go with my hosoban close-up; and (2) confirmed the uniquely late date of that hosoban. And, okay, collectors are odd, but I was happy as well to document that my ladies had enjoyed pride of place just behind the lead musicians. At least I assume first position was an honor. Is there some nerimono expert out there mean enough to rain on my parade? Regardless, no sooner did I arrive home from the print shop then I raised up my arms and shouted, "Banzuke, banzai!" Note: For much more on nerimono hosoban and unraveling the Gion genome, see Andon nos. 63 and 75. This article originally appeared in Daruma, no. 48, Autumn 2005. Copyrighted © text and pictures reprinted with permission.